Situated within the heart of the picturesque village of Findhorn, Rosebay Cottage is just a stone's throw from the water's edge of Findhorn Bay. With glorious sandy beaches, local bakery, a choice of two family friendly pubs, the village shop and post office all within a short stroll, Rosebay Cottage is the perfect holiday base from which to enjoy all that this astoundingly beautiful area has to offer. Findhorn is located within Moray in North East Scotland, and is well known for its milder climate. Its proximity to the Cairngorm National Park and the beautiful Moray coastline make it an ideal location to enjoy a variety of outdoor pursuits. 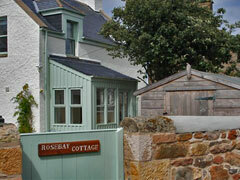 New to the owners in December 2009, Rosebay Cottage has been lovingly renovated. It provides very comfortable and relaxed accommodation, from which you can enjoy upstairs views across Findhorn Bay and the Moray Firth. 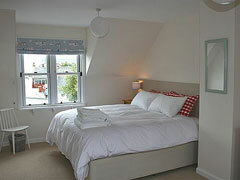 Rosebay benefits from lots of natural light and children are welcome in this pet friendly home by the seaside. With its peaceful, enclosed south facing garden, we have created a special self catering cottage for you to relax in and to enjoy the many amenities around Findhorn Bay and beyond. 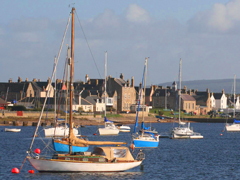 Whether you choose to come to Findhorn for the sailing and other water sports, for family fun on the beach, for walking, wildlife watching, or simply to relax and enjoy this tranquil village location by the sea, we are striving to ensure your holiday at Rosebay will be an enjoyable one.